It’s been years since Harriet McPhail has tended her own garden. But outside near the garage of her new home — far from the settling debris of Zug Island and the Marathon oil refinery — lies a perfect patch of sunshine just waiting for vegetables. Harriet remembers the garden her mother, Gloria, used to cultivate in Delray, filled with tall and healthy green plants that she could never grow in Delray today. 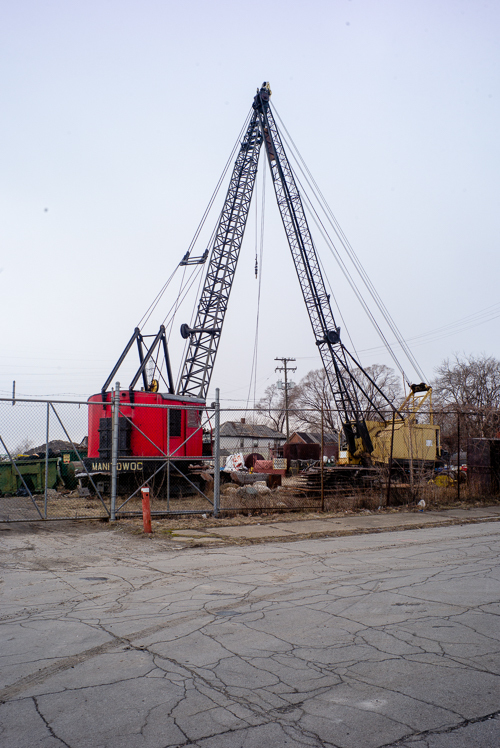 Bridging Neighborhoods is funded by community benefits money from a $45 million dollar deal negotiated in 2017 between the city of Detroit and the Windsor-Detroit Bridge Authority over land that will be used to build the Gordie Howe International bridge and a related plaza. The program manages home swaps for residents directly affected by the bridge as well as an environmental mitigation program for homes located in Delray and near the expanded I-75 service drive in Southwest Detroit. Although the home swap program is overseen by the city, its origins are rooted in community organizing. In 2008, as the impacts of doubled border traffic and congestion linked to the new international bridge and the expansion of I-75 became clearer, an organization called the Southwest Detroit Community Benefits Coalition (SDCBC) came together to advocate for the neighborhood. In talks with the city over a community benefits deal, the coalition's director Simone Sagovac, says her organization lobbied to create an option for homeowners who hadn't been bought out through eminent domain that might want to leave but would be stuck just outside the boundaries of the bridge's project zone. The coalition's efforts eventually led the establishment of Bridging Neighborhoods. The program gives qualified Delray residents, who lived in their homes before June 23, 2017, a choice: they can decide to relocate into a newly renovated Detroit Land Bank home in another part of the city, or they can choose to remain and receive special health-related updates to their homes, like air filters, insulation, new windows, and HVAC systems. Launched in 2017, Bridging Neighborhoods is now working to find Delray residents new homes. To help with this task, it maintains an office inside the project impact area at Springwells and I-75, hosts community meetings, and sends out employees to visit the homes of residents who have difficulties getting around. And it continues to stay in contact with the coalition. "We’ve been doing everything we can to work with Simone and her advisory group to meet resident needs,” says Bridging Neighborhood's director Heather Zygmontowicz. Harriet McPhail first started going to bridge meetings led by the Michigan Department of Transportation (MDOT) back in 2007. When possible her mother Gloria, who suffered from heart trouble, diabetes, and COPD, would attend with her. At the time, Harriet thought everyone would be bought out, as did many other residents. Eventually zoning split the neighborhood into two groups: those whose homes the state purchased through eminent domain and those who weren't. This led to situations where only a few occupied homes remained on otherwise vacated streets. That atmosphere of abandonment weighed heavily on the McPhail sisters and their mother, who remembered how Delray was when their family first moved into a wood-frame house on Vanderbilt Street around 45 years ago. Back then, it was a spirited community with scores of active businesses, well-attended churches and schools, and a community center that would host neighborhood barbeques. Beyond that, remaining in Delray, sometimes referred to as Michigan's most polluted neighborhood, seemed to escalate Gloria’s breathing difficulties. The windows couldn’t be opened in the summertime due to all the dust and pollution in the air. "My mama was like a prisoner in her own home,” Pam says. Along with her sisters Iris and Annette, Harriet started going on land bank tours sponsored by Bridging Neighborhoods. Thinking of Gloria, hooked to an oxygen tank, and Pam, restricted by a wheelchair, the sisters took pictures and videos to share what they’d seen. Though Delray had been her home for decades, Gloria, 82, got to the point where she was ready to leave — not just for health reasons, but also because many friends had moved on, in one way or another. The Delray neighborhood where the McPhails lived is heavily industrialized.On the day Harriet first saw her Warrendale home, the streets were wet with rain. Annette and Iris accompanied her inside. It was the second house they’d visited in the area, though they’d been on previous Land Bank tours in other neighborhoods. The home needed a ton of work, but the bedrooms were roomy and there was a park down the street. Outside, there was space between houses, space to breathe. Her mother’s heart doctor wasn’t far away and there was a church just around the corner. Gloria would like that. They could all attend. The McPhails attended a neighborhood meeting in Warrendale; community members welcomed them in and that sold them on the neighborhood. They discussed local events and community gardens. Warrendale was eager to have the McPhails. From the perspective of the Bridging Neighborhoods program this welcoming attitude makes sense. Choosing where to direct relocation options, the city had asked: What neighborhoods really want new neighbors? "It was Warrendale and Morningside, so we focused there to begin with,” Zygmontowicz says. The city also wants to obtain more property for the Home Swap program in the Springwells area of Southwest Detroit, north of Delray. But it’s very populated. The program has some housing in most every school district within the city. The sticking point is they often require a lot of work and the budgets for renovations through the program are $65,000-$75,000 per house, which isn’t always enough to restore large blighted homes to the satisfaction of potential occupants. No money changes hands in the Home Swap program. Qualifying Delray residents just need a clean mortgage title, up-to-date taxes, and a payment plan for utilities if needed. Their former homes are boarded up and may be slated for demolition. The Home Swap program is set up to accommodate residents from roughly 220 Delray homes. Since renovations on land bank homes began in August 2018, 28 purchase agreements have been signed and nine households moved into new homes. There is no end date for residents who qualify for the Home Swap program. Enrollment for the I-75 mitigation program, which has approximately 115 applications, closed on March 31. While Sagovac is pleased to see some residents taking advantage of the Home Swap program, there are still barriers to participation. "This will take time for people to start seeing results,” she says. Groups who find it difficult to engage include residents who struggle with eligibility because of back taxes, seniors who will find it difficult to start over in a new location or are dependent on their current community networks, and large families who haven't seen land bank homes that fit their needs. Last summer, on a warm June morning, Gloria unexpectedly left Delray, ahead of her children. Her health finally failing, she passed away before their family could complete their move. Harriet knows her mother would want her girls to have peace. And they’ve found it here in their corner house, with its freshly painted walls and its plush carpet and mahogany cabinets, in a place where the community is active and growing. All photos by Steve Koss, except where noted.